1) The 1971 ABA Floridians celebrated St. Patrick's Day with special uniforms. 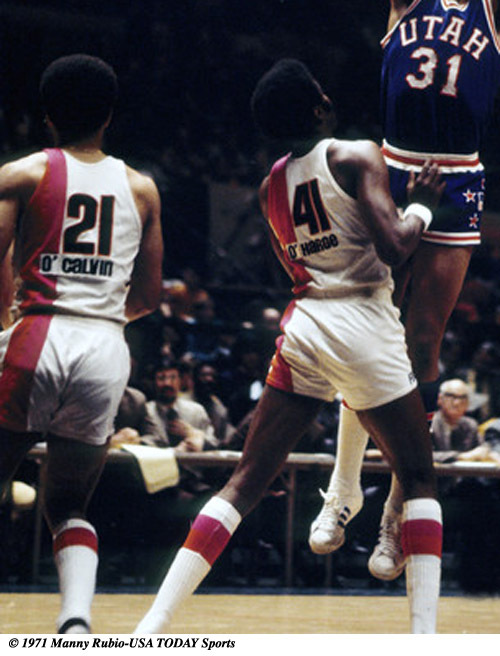 The Floridians, an ABA team that played home games in Miami Beach, Tampa, and Jacksonville, did not wear green. They did wear black, magenta, and orange. And they celebrated St. Patrick's Day in style on March 17, 1971 when they played the Utah Stars at Madison Square Garden in New York. The team added an "O" to the last name of every player that night in what could have been the first uniformed celebration of St. Patrick's Day in the history of American professional sports. 2) The 1918 Chicago Cubs wore green. Over the past 140+ years very few Major League Baseball clubs have featured green as a primary color. The National League's Troy Trojans of 1882 wore green, as did the 1910 Philadelphia Phillies. The 1918 Chicago Cubs—eventual NL pennant winners—wore green, at least on the road. The New York Times referred to them as "Green Sox" on multiple occasions that year. 3) The 1937 Brooklyn Dodgers wore green. Other than the green of the grass, MLB was a land without greenery for nearly two decades following the 1918 Cubs' use of the color. That all changed in 1937 when the Brooklyn Dodgers went green. They stayed that way for only one season, then switched to the now-familiar blue look that they have retained ever since. 4) The New York Jets wear green because of St. Patrick's Day. When the American Football League's New York Titans changed their name to "Jets" they adopted green and white as their official colors. The change, announced on April 15, 1963, featured some classic public relations bloviation in the form of a statement by team spokesman Ted Deglin, who said that "New York is a green-conscious town, from the dividing stripe down Fifth Avenue to the verdant hills and dales of Westchester to the beautifully landscaped parks of Long Island." Sonny was born on St. Patrick's Day, and his favorite color is green. His Jet office has a green rug. Jet Stream, the team's house organ, which is given to such superlatives as JETS SIGN THE BEST, NAMATH, HUARTE LEAD THE PARADE, is printed in green ink. The team colors are green and white. When Sonny signed Namath he gave him a green Lincoln Continental. He once said that the green and white were assigned to the team "because they're my colors." 5) The Cincinnati Reds debuted the first St. Pat's Day uniforms in front of a pissed-off George M. Steinbrenner in 1978. This New York Times article says it all. The Reds gave birth to tradition on March 17, 1978 when they trotted out wearing green-clad uniforms for their exhibition game against the New York Yankees in Tampa. George M. Steinbrenner III is quoted as saying "I think the green uniforms matched my complexion after seeing the inadequacies of the team that is supposed to be world champion." What about the famously green (and gold) Kansas City and Oakland Athletics? Watch this space.